This is the first of a three part interdisciplinary math project. Students will be investigating caffeinated beverages, dangers of caffeine, and how advertising affects our perceptions. 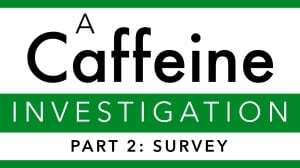 Students, now armed with data about five caffeinated beverages, will survey a set of peers and/or adults to uncover misconceptions about caffeine. In this final part of the caffeine investigation, students will analyze advertisements, and then create a public service announcement.